I have such a fun snack for you today! 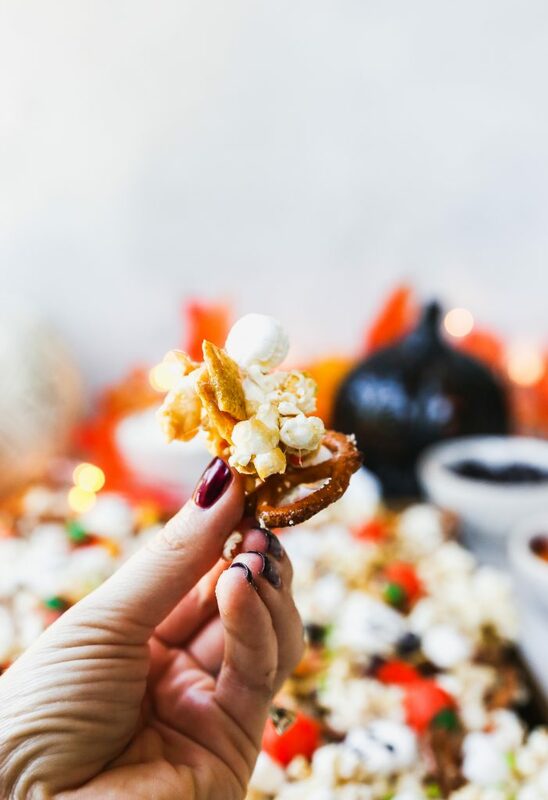 This monster munch marshmallow popcorn snack mix is PERFECT for any Halloween festivities you may have coming up. Having a costume party? Put a huge bowl of this out next to the spooky punch and witch finger cookies, and people will be so impressed. 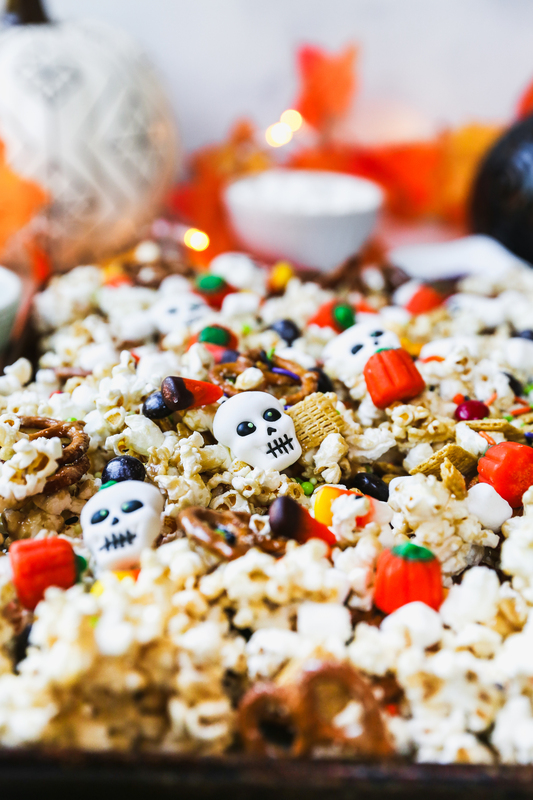 Looking for something fun to munch on while you watch scary movies? This is it. Admittedly, I am not the biggest Halloween fan. Don’t get me wrong, I enjoy it (especially now that I have a kid), but I’m not one of those people who goes absolutely nuts for it. It’s the whole coming up with a costume thing. I never feel inspired or creative enough to come up with anything good. I also cannot stand anything scary. I haven’t watched a scary movie since I was a teenager, and that is better for all involved. Trust me. I just cannot handle it. But the idea of having a spooky Halloween party? OMG. I’ve wanted to do it for YEARS. Dan and I were just talking about it the other day, and he said “You say this every year. It never happens.” Womp womp. The timing just doesn’t ever seem right. Plus, October seems to sneak up on me every single year. September goes by in a blink, and before I know it, it’s Halloween. Crazy. Maybe someday I’ll get it together enough to pull it off! If we ever get there, this monster munch mix will be on my serving table of ghoulish snacks and treats for sure. It is SO fun and festive, and kids and adults alike will freak over it. Kieran just about lost his marbles when he spotted the candy skulls. The best part? It’s DELICIOUS. 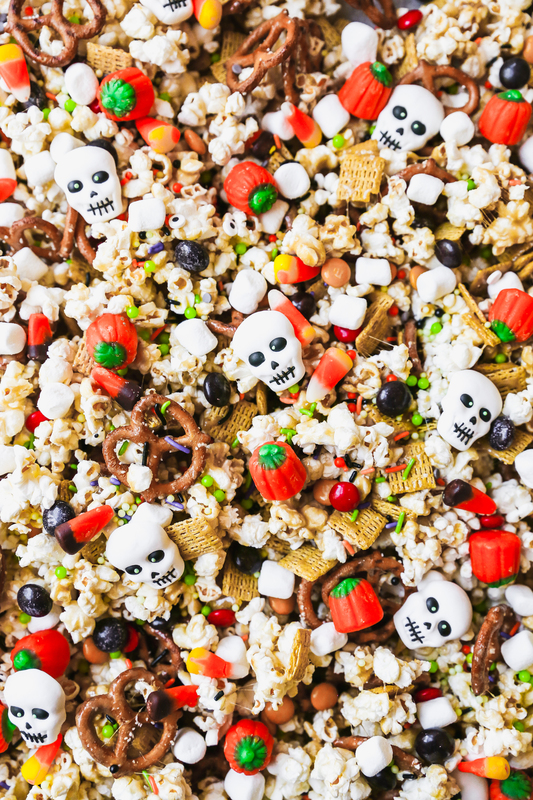 I pop a bunch of popcorn and toss it with other salty things: peanuts, pretzels, and cereal. OK, so the cereal isn’t salty, but it adds an amazing crunch. I went with a cinnamon-flavored one here, because it felt more fall-ish. Then! The most decadently good marshmallow cinnamon caramel gets poured over top of everything. You toss and toss until everything is coated in the gooey goodness. This marshmallow caramel is magic! It stays soft and gooey! But not to the point that you’re totally covered in stickiness (unless you’re my son, who somehow always manages to have sticky hands, even though I make him wash them approximately 20 times a day. Anyone else? Just my kid?). 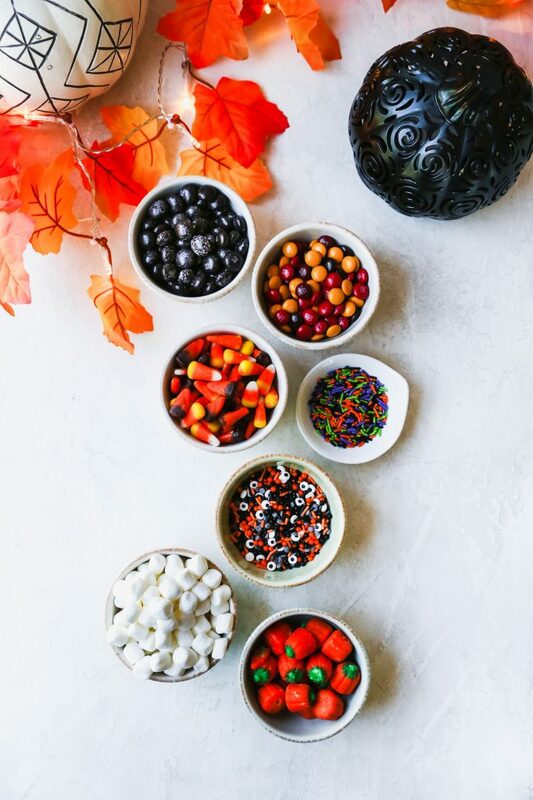 And then you can top it with whatever festive and fun candies you like! I found some Halloween-colored M&M’s and some COOKIES AND CREAM M&M’s (OMG, so good) at my Target and thought they’d work great here. 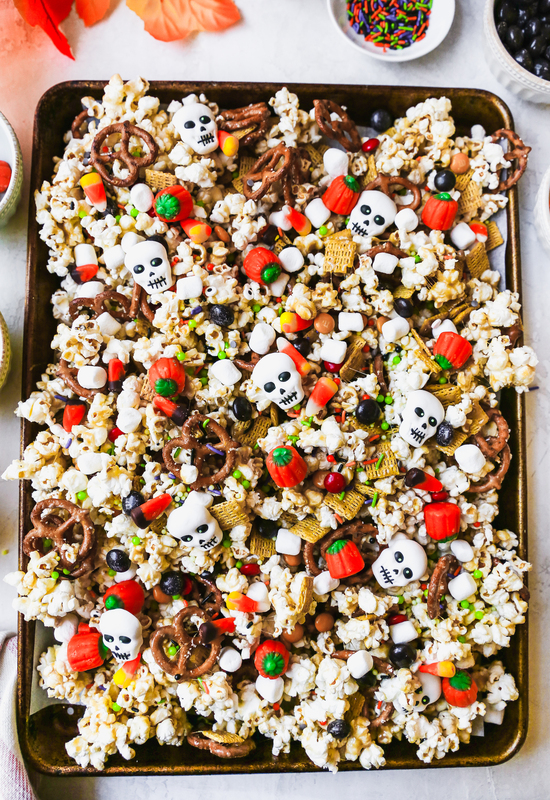 I also added some fun Halloween sprinkles, mini marshmallows, candy corn/pumpkins, and the candy skulls. 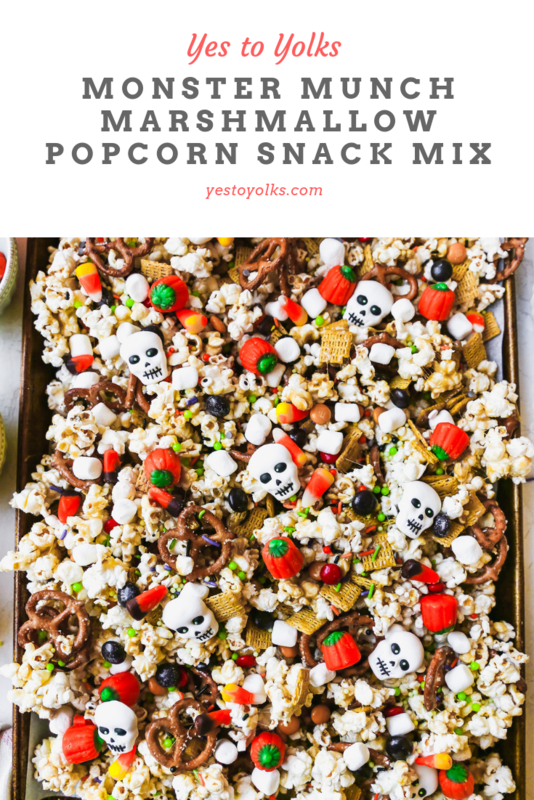 I absolutely love making snack mixes like this, and popcorn is probably my #1 favorite snack of all time, so this just makes sense in my brain. In a medium saucepan, melt the butter over medium heat. Add the brown sugar and corn syrup and cook, stirring constantly, until melted and combined, about 2 minutes. Add the marshmallows and stir until completely melted. Remove the pan from the heat and stir in the vanilla, salt, and cinnamon. 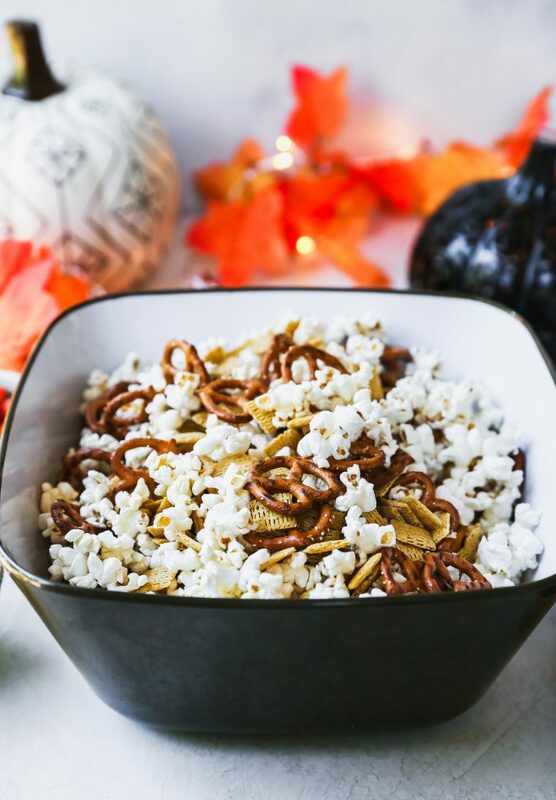 In a large bowl, toss together the popcorn, pretzels, cereal, and nuts. Spread the mixture out in an even layer on two large baking sheets lined with parchment paper. Carefully pour the marshmallow coating over the mixture, coating it as evenly as possible. Gently toss with a spatula until everything is evenly coated. Once the mixture has mostly cooled, add the mini marshmallows, M&Ms, candy corn, and sprinkles. You still want it a little bit warm so these things adhere to the popcorn. Store the snack mix in an airtight container for up to a week. It should stay soft and slightly gooey. 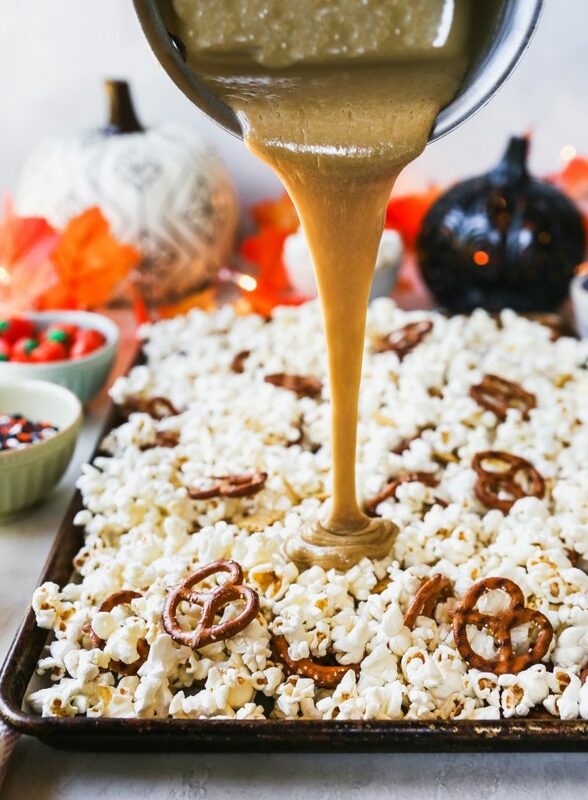 This is a Halloween-themed adaptation of this recipe.